Heads will roll after the Davao City bombing last Friday that killed 14 people and injured 67 more. Mayor Sara Duterte-Carpio allegedly wants the commander of Task Force Davao Col. Henry Robinson Jr. replaced. Robinson assumed the post only last May 2016. It was learned that the mayor is also contemplating on replacing the newly-installed Davao City Police Office director Sr. Supt. Michael John Dubria. Dubria just assumed the post last June 2016. No replacements have been identified so far for the two posts. Mayor Duterte is said to be very disappointed with Friday night’s bombing which happened under the very nose of the police and Task Force Davao. TF Davao personnel as well as police are always seen in the Roxas Boulevard night market securing the area. Thousands frequent the area every night for its ukay-ukays, food stalls, and massage services especially during the weekends. Mayor Duterte is also set to offer a P1 million reward money for anyone who could give information about the suspect/s and another P1 million that could arrest the perpetrator/s who placed the IED in the massage area of Roxas Boulevard that evening. The police said that they already have about three to four persons-of-interest. Two of them are said to be females. There are also about eight witnesses who gave information to the authorities that led to the identification of the POIs. Witnesses earlier claimed that a tall bearded man left a bag in the massage area and hurriedly left. Few seconds after, the explosion happened. PNP chief Ronald dela Rosa said they are currently cross-matching the POIs to a gallery of known terrorists. Dela Rosa said they are also waiting for the post-blast report of the Explosive Ordnance Disposal (EOD) unit. Initial findings showed that the IED is crafted from a mortar round based on the fragments taken from the blast area. According to dela Rosa, the explosive is closely similar to the signature IED of Abdul Manap Mentang, the suspect in the Valentine’s Day bombing of the Davao City Ecoland Terminal in 2005. Mentang remains at-large. 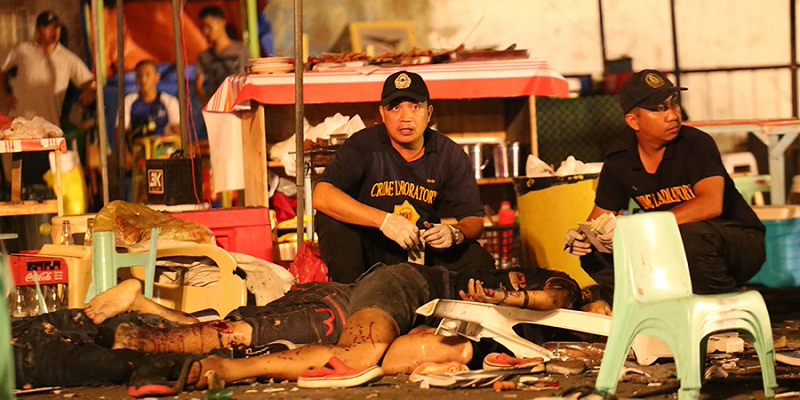 Dela Rosa said it could be possible that Mentang is involved in the night market explosion in Roxas last Friday night.